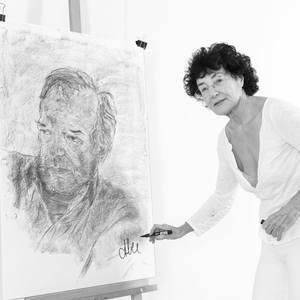 Alice Tournikioti has presented her works in Greece (Athens, Mykonos, Santorini, Zakynthos, Nafplio, Kalamata, Thessaloniki, Hydra), Europe (Geneva, Cyprus, Madrid, Berlin, Florence, Rome), Turkey (Istanbul), Asia (Tokyo) and America (New York). Her works are also in the collections of the National Bank, the Bank of Greece, Alpha Bank, Commercial Bank, Eurobank as well as the Vorre Museum and the National Gallery in Rhodes, and also in many private collections. The viewer studies and penetrates the realities that the painter shows, as her subjects are distinguished by a deep nostalgia and a sensual exoticism, while at the same time they dispose of sincerity and the appearance of truth, without ever focusing of the specific. Alice paints with deep sincerity and creative liberty, depicting figures and their environment through what feels like automatic writing. She draws in paint and colors with drawing, at the moment when space gives birth to the figures and these determine its self signifiers. Her unforced brush strokes, full of light and colour, power and sensitivity, boldness and imposition, liquidity and speed, thickness and in other places transparency, transers us to a blooming climate, there where everything is over and beginning again, on the slopes of frgetfulness and in the expanses of gazing. Alice’s figures, at times solitary and others surrounded, convey the loving relationship, the reconciliation of contrasts and comradeship. They also convey their optimism and desire for life, to us, through an “nnocence” of her look, outflanking the dead ends with revolutions.